The financial custodians of your business are complaining that the investment in inventory is too high. Cash flow is tight, there isn’t significant ROI, warehouse space is limited – whatever the reason, you are tasked to bring the investment in inventory down. It is quite easy to do. Simply order less and gradually the investment will reduce. Unfortunately, this may also risk losing sales, as ordering less of the items that are moving could cause stock-outs. We have already addressed the stock-out crisis and want to avoid that as much as possible. Simple! 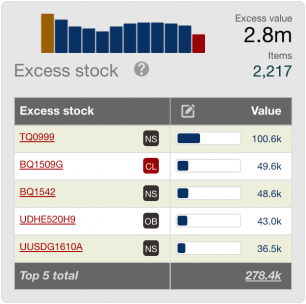 First, identify which items have excess stock. By definition, any item carrying more stock than that item’s maximum level would be identified as an excess stock item. Note that obsolete items would have a maximum stock level of zero. The amount of excess stock would be computed as the difference between the maximum stock level and the available stock. The associated excess stock value of all items identified as excess can be compared to a realistic stock reduction goal. Now you have a powerful metric! No matter how painful it is, make it visible. 2. Avoiding creating “new” excesses. Prioritise! Which excess stock items to action? With a few simple inputs, NETSTOCK can quickly present this information to you and the app makes it easy to monitor your progress. Notice that five items are presented ranked by their excess value. These would be the worst offenders and if you could action their excess stock, it would make the largest impact on your business. Start working through items and consider what options you have to minimise the problem – depending on the item and circumstances, you may be able to redistribute it, return it, re-engineer it, or promote it. In some cases, you might have to scrap it. And if there are any purchase orders for excess stock items, they should be investigated and either cancelled or delayed. The point is that excess stock ties up investment – which could be better-used purchasing items that are stocking-out – and it adds to inefficiencies in your warehouse. 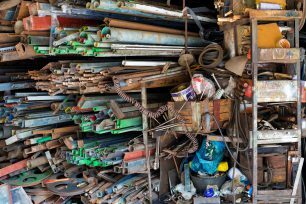 Try to quantify the cost of unnecessary storage space and insurance, not to mention procedures like having to do stock counts of obsolete items. This might reveal that the “scrap it” option is not so bad! For all businesses that need to provide high availability to keep their customers satisfied, stock-outs are quite simply a nightmare. 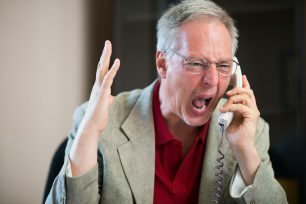 Dealing with angry customers can send stress levels of your employees soaring. 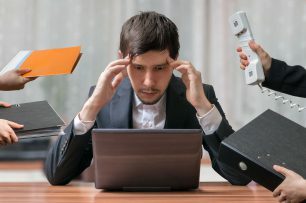 Your order and sales staff will do whatever they can to placate the customer while your purchasing and planning colleagues have to run in circles, begging and pleading with suppliers or manufacturing. Whichever way you look at it, it’s not a pretty picture. Unfortunately, as much as it would be wonderful to banish the stock-out completely, they are a reality. And it is not necessarily faulty replenishment that is to blame. Predictions for supply and demand will never be completely perfect; the greater the inaccuracy, the greater the risk of stocking out. Check that the stock-out is legitimate – misleading data can distort the picture and you don’t want to put a plan of action in place based on inaccurate data. Double check the current stock level, and then factor in supplier orders and purchase orders. Before making plans to find stock, ascertain whether your customer will wait for the stock and for how long. Good communication could save the day! If remedying the stock-out immediately is the only option, determine what can be done. Is there an opportunity to expedite an existing purchase order or to transfer stock from a nearby location? You may want to consider air-freighting a portion of the order. Can you source from an alternate supplier or even a competitor? This might seem extreme, but may be worth the effort and expense if you can prevent the loss of a sale, or worse still, the loss of a customer. Most importantly, resolve why the stock-out occurred and avoid repeating the same set of circumstances. Constantly working to resolve the root causes has proven to reduce the occurrence of stock-outs over time. What if you could identify potential stock-outs? Eventually, as your stock-outs diminish, you can start to focus on items that are predicted to stock-out based on the forecasted usage within the lead time period. NETSTOCK is designed to highlight these items, and by following the same steps above, you may be able to avoid the stock-out altogether. Proactive management of potential stock-outs can transform crisis-style inventory management into inventory management excellence! See our previous blog in this series: Do you have time to transform your business? Do You Have Time To Transform Your Business? Enter technology, an enabler to help you get things done quicker and smarter – right? ERP systems exist to crunch the numbers, but in order to quickly and easily make decisions, you need systems that distil that information in a way that can potentially transform your business. Your Inventory Management System is no exception. Make sure your inventory information is clear and concise. Highlights areas to be managed by exception. Information must be dynamic and presented succinctly – too much information will dilute your endeavours. Usable metrics are those that channel your focus and initiate decision making. Beware of vanity metrics which typically report a number in isolation. They tend to generate responses like “Wow, so what should I do with this info?” This type of metric’s only real use is for their feel-good value. Metrics need to be meaningful — if you find yourself doing mental arithmetic to make sense of a metric, you probably should change the metric! Showing rates and comparisons lends real-world weight to metrics. Don’t hide from offending metrics – they are actually a call to action to fix broken processes, which is always a good use of your time. The practice of management by exception also goes a long way to use your time effectively, whereby attention is focused only on those areas in need of action. Better still, what if those exceptions were ranked by the impact on your business? Now you can deal with the biggest issues first, knowing that every issue you resolve is having a significant impact of the health of your inventory. This is the most effective way to get the most out of each day and to drive more profit from your inventory. The ideal venue to view metrics and foster management by exception is a user-friendly dashboard. 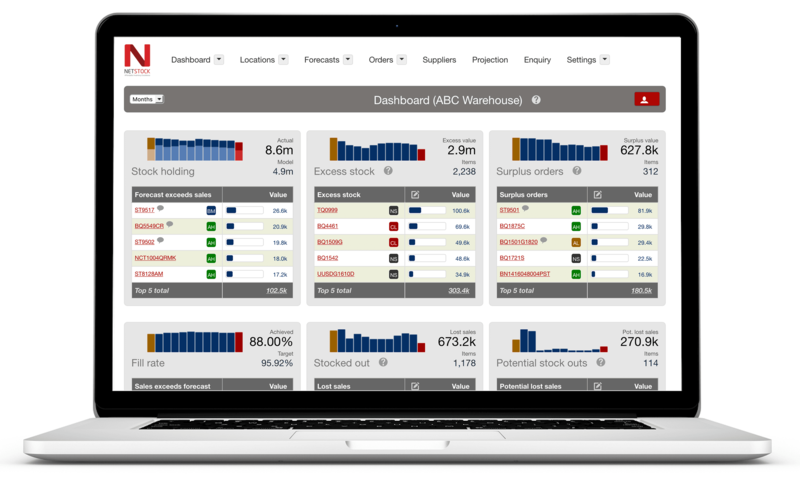 The NETSTOCK dashboard is a perfect example of how key metrics indicate a company’s inventory health. Note how the metrics show period comparisons, benchmarks, targets. Crucially, the NETSTOCK dashboard shows the most problematic items within each metric so you can take immediate action to improve your processes every day.